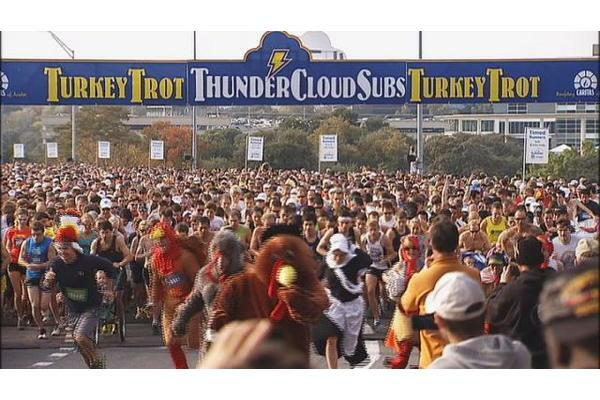 The ThunderCloud Subs Turkey Trot is one of Austin’s most beloved traditions. Held on Thanksgiving Day since 1991, the Trot is Texas’ largest five-mile run and continues to grow each year. Most importantly, 100 percent of the proceeds benefit Caritas of Austin–an organization dedicated to preventing and ending homelessness, poverty, and hunger in the greater Austin area. As Austin continues to grow at a record pace, affordable housing and resources are becoming increasingly scarce, putting even more people at risk of experiencing poverty and homelessness. Now more than ever, we ask you to partner with us in the ThunderCloud Subs Turkey Trot to help support Caritas’ mission. The money raised at the Turkey Trot each year is critical to Caritas’ work helping thousands of individuals and families achieve self-sufficiency. Last year, more than 20,000 runners raised $325,000 for Caritas. Your sponsorship helps continue a long tradition of helping those less fortunate in our community.